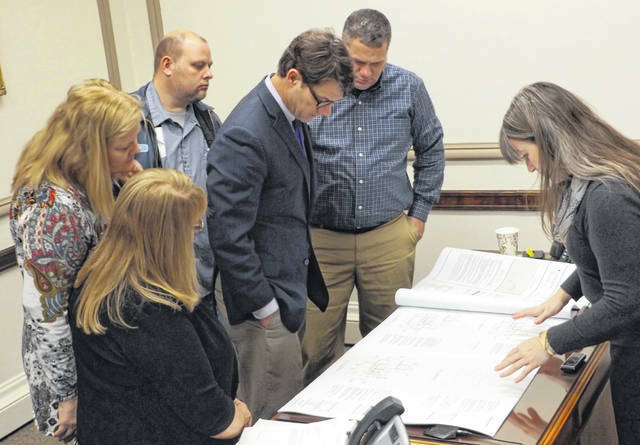 Elizabeth Visser, right, with Casler Design Group Inc., shows Clinton County officials detailed plans for a project to transform the former space of the Clinton County Board of Elections (BOE) into new space for the Adult Probation Department. The plans include a small restroom to be used for drug-testing checks rather than utilizing a public restroom as is now the case. Once completed, the location also will provide a waiting area for those on probation, and more privacy for the face-to-face appointments held between supervision officers and people on court-ordered probation who are required to report in person. Commissioners are ready to put the project out to receive bids from contractors. The BOE has already moved to the County Annex Building on South Nelson Avenue on Wilmington’s west end. Clockwise in the photo from the left foreground are Clinton County Commissioners President Brenda Woods, County Administrator Mary Ann Haines Foland, County Maintenance Director Jeff Williams, Clinton County Commissioners Kerry Steed and Mike McCarty, and Visser.